They are tiny mini baby dolls, aptly called Tinsy Winsy Weeny Tots. Tinsy Winsy Weeny Tots are an adorable new collection! They are realistic miniature baby dolls which kids can collect and care for which fit perfectly into their little hands. There are 15 Tinsy Winsy Weeny Tots available to collect as well as cool accessories. Each doll comes with a super cute miniature outfit and an accessory. They even had a teeny hospital wristband with their name and date-of-birth, making them more realistic for role play. The babies have soft huggable bodies, and their faces are... too cute. The Tinsy Winsy Weeny Tots Pram Accessory Set is the perfect accompaniment to add to the collection. 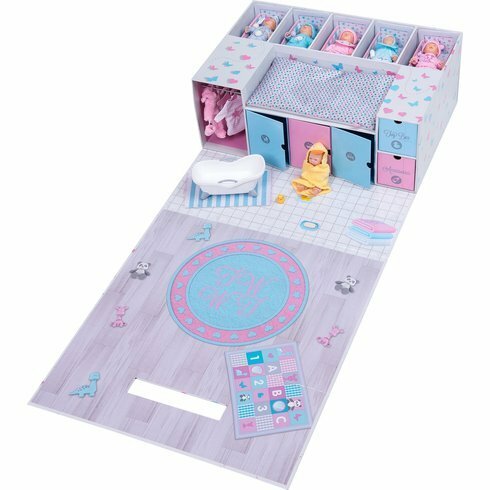 The set not only includes a baby doll but also includes a pram, a changing bag, mat and a nappy. Summer is loving her dolls at the moment, and she was super excited to be sent a set of new Tinsy Winsy Weeny Tots for review. She instantly fell in love with each of them, she was fascinated by their tiny little faces and hands. She also enjoys putting them into the Tinsy Winsy Weeny Tots pram and pushing them around. Tinsy Winsy Weeny Tot dolls starting from £7.99.